The Abandoned House is located in Markarth next to Arnleif and Sons Trading Company. Although abandoned, the house is fully furnished. It has three rooms and a tunnel in the basement leading to a shrine to Molag Bal. The front door opens to a spacious, multipurpose room. A cupboard just to the right of the front door holds a Potion of True Shot and a sabre cat pelt, as well as some wine and alto wine. Right next to the cupboard is an unlocked chest containing leveled items. A selection of iron weaponry and a hunting bow is displayed on the next table, as well as more wine and alto wine. However, any of these may become dislodged during the first stages of the related quest, and subsequently found on the floor nearby. The dresser is a safe storage option, but contains only clothes. An iron mace is sitting on top. The other side of the room serves as a kitchen and dining area. While the spit over the fire is not usable, plenty of foodstuffs can be found in this area, both on the table and scattered on the floor. A basket with two cabbages is by the front door. A small round table around the corner has a bottle of wine and a bottle of Alto wine along with a loaf of bread. To the right of the fireplace you can find two rabbits and a pheasant, along with a wedge of Eidar cheese and another cabbage. The cupboard by the fire holds only tableware, but is a safe storage option. The table is laden with food: baked potatoes, grilled leeks, rabbit and pheasant, and a salmon steak. There is also a goat cheese wheel along with more bread and wine. Dried frost mirriam, two garlic braids, and dried elves ear are hanging to the left of the fire. A second unlocked chest is by the table and contains leveled items. The end table has clutter, but is another safe storage option. The second room is furnished with a usable bed. A secret chest containing leveled items is tucked underneath the foot of the bed. More safe storage options are in the bedroom including the end table by the bed, and the dresser across from the bed. The cupboard is also safe and holds a potion of minor healing and an iron sword, and a sabre cat pelt. A copy of Boethiah's Proving may be found under the cupboard if you have not found it previously. An unlocked chest is by the doorway to the next room and contains leveled items. The next room and lower levels of the house are used mostly for storage. A coin purse, clutched by a skeletal arm, is on the pillar at the foot of the stairs. To the left, there is a cupboard containing clutter, wine, alto wine, and some bread. Straight ahead, on the west wall, more rabbit and pheasant are hanging, as well as elves ears and garlic. Potatoes, a gourd, and a second sabre cat pelt are found here as well. To the right, there is a bench with some sacks, bread, and an Eidar cheese wheel. Across the doorway, there is a cupboard containing clutter and some Potato. Next to this is a bench with more sacks. The furniture is safe storage, but contains nothing of interest. Before the next room, there is a small area with a bench containing clutter, some sacks, and a barrel. The next room down contains a desk with some wine, Nord mead and a barrel containing more Nord mead. To the left, there are many barrels, lots of which contain more Nord mead. There is a cupboard to the left of these containing clutter, some sacks, and some wine and alto wine. In the remaining half of the room, there are multiple cupboards containing clutter and sacks. There are more barrels, lots of which contain Nord mead. When exploring the room, you will notice a draft coming from the south. Following up on this leads you to a tunnel heading down. 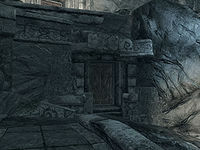 The tunnel winds through some Dwemer ruins to the shrine of Molag Bal. There are no items of interest in these tunnels; just clutter. The house can be used as a free home as items will not disappear from the containers. There are no cooking, alchemy or enchanting facilities, but the house has the largest amount of storage containers in the game—62 in total. The poltergeist effect that triggers as part of the House of Horrors quest can be avoided to keep the house tidy. If Vigilant Tyranus is killed before it starts, it will never happen and all furniture will remain positioned normally. The quest will proceed without problems. 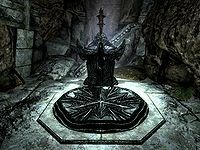 A copy of the book Boethiah's Proving can be found under a bookcase in the second room (after you reach level 30), which leads into another Daedric quest. There is an "Empty" shadowmark to the bottom left of the entrance door. This page was last modified on 13 May 2017, at 09:14.